- List of top 50 users (firstname last initial) their rank and point total. - Would always show current user highlighted in some way, even if their rank is greater than 50. 6. Login screen with facebook, instagram and email/password login/register options. They are not required to login (unless they want to check-in) so this would be a screen inside the app accessible from the menu versus a forced entry screen. For the final deliverable, I would want all the icons and images broken into assets I can use on iOS and Android. We can obviously talk more specifics as we work on the project. I have attached the company logo that I would like to use as inspiration for the design. 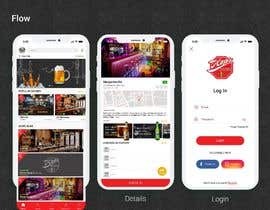 The app is primarily focused on beer specials but mixed drinks will also potentially be available. For the contest, I really want to see screens for 1 and 2 before anything else to judge the overall style. hello.! are you accepting entries now .? Hi there all! The contest is now closed and I have accepted Nich B. as the winner....thank you all for your thoughtful submissions! Are you still accepting entries? I will submit first set of samples today. Still working on last few pages. Please don't close the contest early. Hey, im working on it will i have 2 days to send it? please check #17 , #16 and provide me feedback so i will do revision for you. hii, can I design in adobe XD ? As long as you can deliver the final assets for iOS and Android then yes.